Got my car started yesterday. 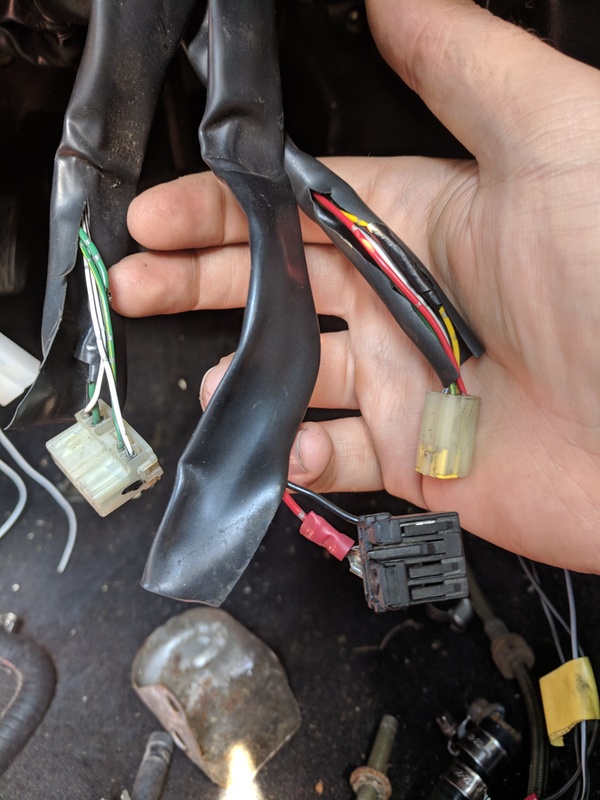 But had to give the brown wire connector on the starter 12v from the diagnostic port (it wasn't getting 12v when key turned to cranking position. 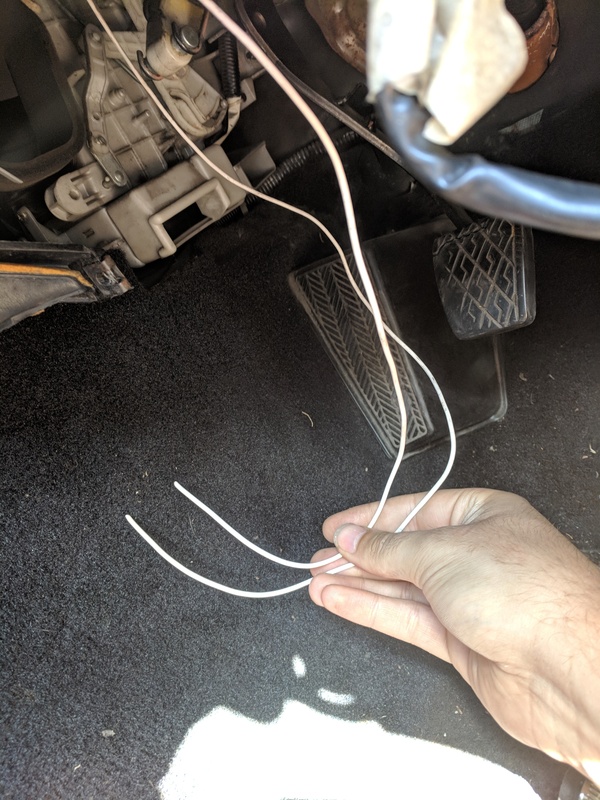 As part of the car tidy up I removed an old immobiliser and I believe part of that intercepted the 12v to the brown wire supply. As you can see. Someone's hacked at the wiring. Everything your seeing is around the dash/steering wheel area. I'll have a look at the diagrams for you tomorrow. The 2nd to last pic with the 2 white wires, looks like non stock wires, find out where they go. The last pic, that thick, cut wire. That looks important in that area. looks like that is the plug up to the steering column. are there any cut wires in that plug? There is some soldering going on there too. this last pic seems like the jackpot. was the old immobiliser in that area? Also might want to look at the fusebox area to the right of the driver's footwell. might want to look under the rear cabin carpet, on the passenger side. oftem security systems tap into wires there. too drunk to help now but i'll dig some diagrams out in the morning for you. 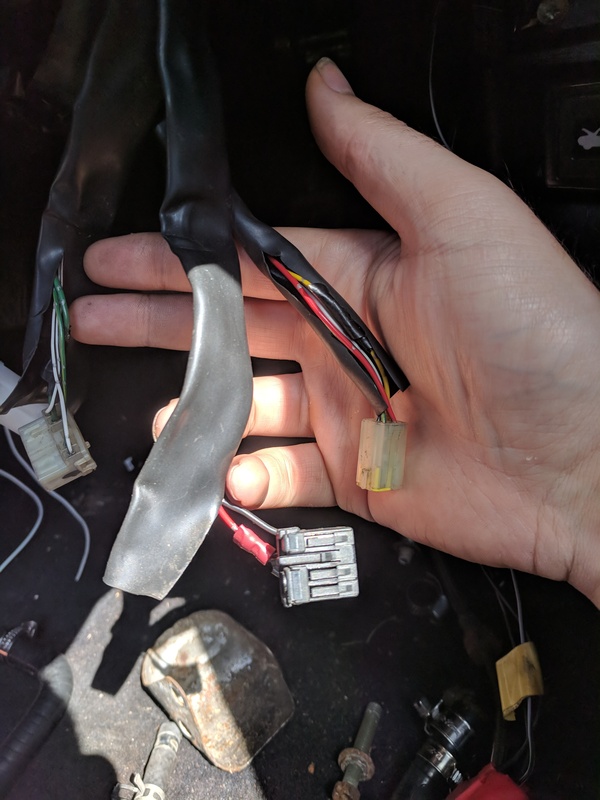 cant see any wires on the steering column modified/missing so im a bit confused. found a ground near the fuse box area, but it went off to a dead end, presume i removed the other end during immobilizer removal. looked under the carpet cant see anything else. the extra problem was there was a turbo timer wired in, so the cut/soldered wires could be from that. i really need to get out to the car and have a proper look. weathers been crap recently though. The last picture won't be it - that's the body control ECU so that will be for alarm related functions around door locks. The wiring diagram I have to hand is for a 3SGE so while the principals are the same the wiring colours may not be. I have provided them just in case. The starter relay is the green one in the boot next to the ECU. 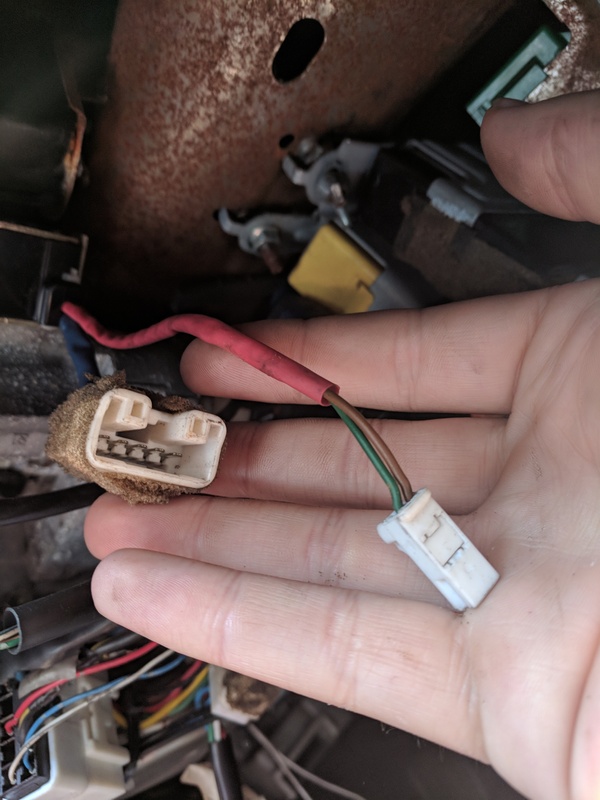 The brown connector on the starter has 1 wire in it (black w/white stripe on 3SGE). That wire goes to pin 4 of the starter relay which is the high current side of that relay. The other side of the high current side is a white wire which goes through the ring/stud wiring terminal on the starter - from there there is a black wire with a red stripe which goes straight to the battery. So first check that you have 12V at pin 2 of the starter relay - if not there is no feed from the starter/battery to the relay. 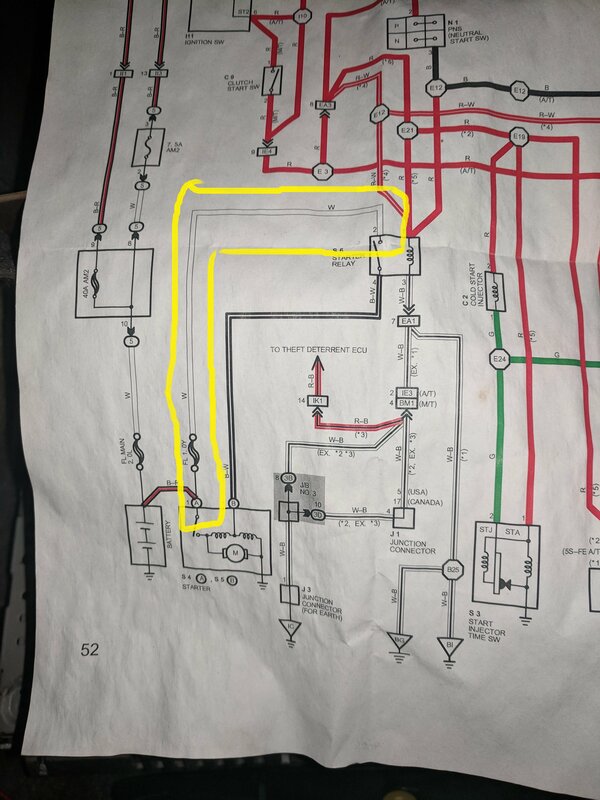 Additionally this white wire that goes from the ring terminal on the starter to pin 2 of the starter relay has a fusible link in it, so if you do NOT have 12V at pin 2 of the starter relay, check continuity between the ring connector on the wiring at the starter and pin 2 of the starter relay. Check you have continuity between pin 4 of the starter relay and the wire in the brown plug at the starter. The relay has a ground going to pin 3 which in the 3SGE is a white wire with a black stripe. Check that pin 3 of the relay goes to ground/earth/negative terminal of the battery. That only leaves pin 1 which is the signal from the ignition barrel. This goes to positive when you turn the key to the STA position. This wire's red at the starter relay. Get a mate to turn the key to the STA position and see if this wire goes to +12V. I'm assuming that all the other electrics through the ignition switch work, as the car runs with the starter bridged to +12V. So if everything I've said above checks out have a look at pin 6 from the ignition switch (red on the 3SGE). 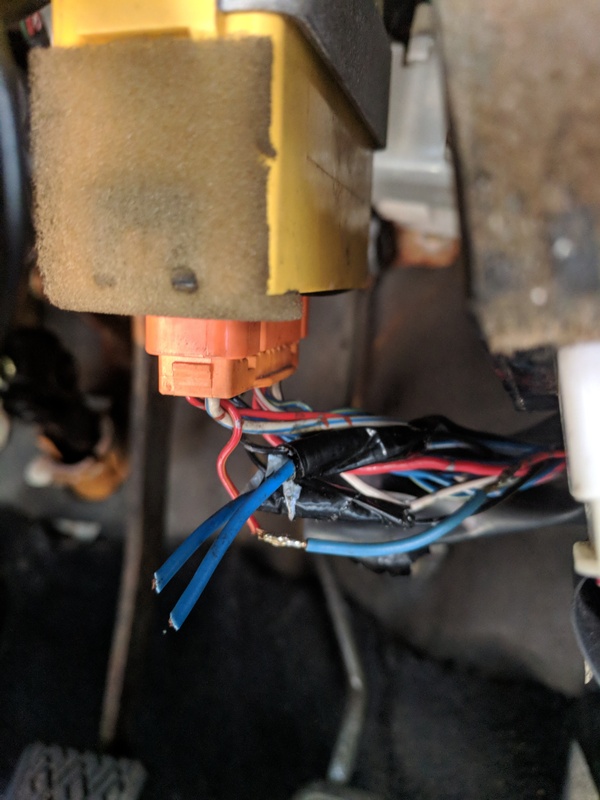 This goes to pin 9 on the ID4 connector (in the passenger footwell) and from there up the passenger side of the car into pin 8 of connector EA3 which is the larger of the 2 white plugs in the engine bay fusebox. ID4 is a 12pin join between the dash loom and the loom that runs down the side of the car. thanks a lot, waiting for an evening ive got time to go through the wiring. right we finally got to attempting your guide toxo. results were all of the circuit works including the ignition turn supplying the signal required to the relay etc. relay is working as expected. we are however not getting 12v on the white wire highlited in this picture. it says its got a fuseable link on it, however we couldnt see anything at all. i may have to strip that part of the loom and run a new wire. 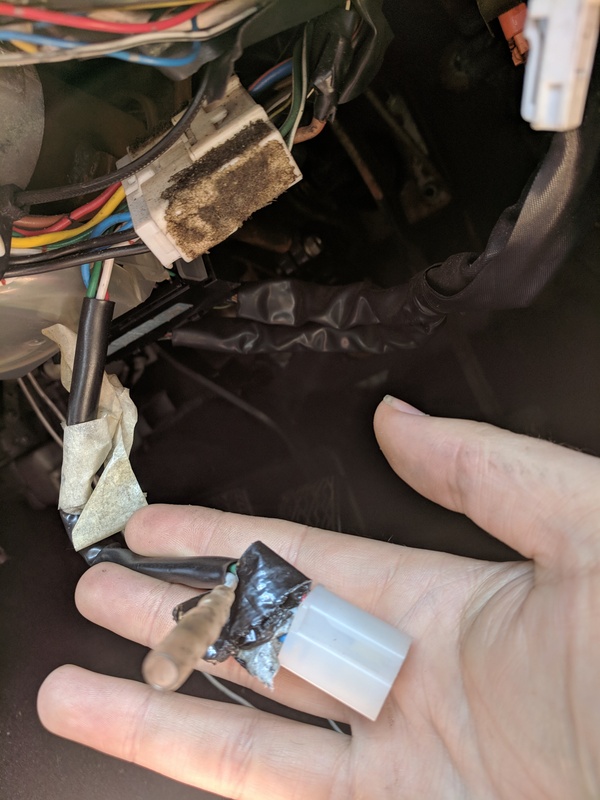 any ideas if the fuse is actually there/exists? Before you go ripping the loom to bits, have you confirmed it by running a wire between the relay and the starter motor to replicate what that one does? No, but Google suggests you're not the first person struggling to find it! well i couldn't find it, and ive ran a new wire from the fuse box to the pin on the relay and she works a treat. I presume theres a break in the existing wire somewhere.